This surgery can be quite expensive, usually the greater the correction the higher the cost. Some people complain about bad night vision even after a successful laser eye surgery. This is usually happens when they look at a light (they see star bursts around the lights). Some times the surgery is not 100% successful and must be done again. In some rare cases the results don’t last (especially for order people) and these people need to wear glasses again or go through a repeat surgery. This type is the most recent type of laser eye surgery. It is refractive eye surgery and it use widely used to correct the refractive state of the eye. In other words the surgeon cuts the flap in the cornea and uses laser to correctly shape the layers underneath. Refractive eye surgery can cure myopia, astigmatism, hyperopia and keratoconus. 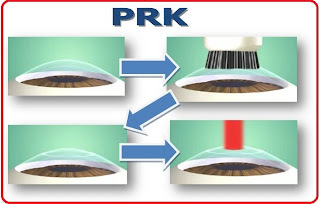 PRK (photorefractive keratectomy) is also a type of refractive surgery. It also involves correction of the refractive state of the eye (correctly shaping the cornea with the laser) in order to correct myopia, hyperopia and astigmatism. Both methods have great results. The main difference is that with LASIK method the recovery is faster and the person can see better faster than with PRK method. On the other hand PRK surgery does not involve the creation of corneal flap and this means less risk of corneal flap complications. Also with PRK surgery the entire thickness of the cornea is available for treatment because this type of procedure does not create a corneal flap. This makes PRK surgery ideal in some cases of people who have already perform Laser eye surgery. PRK also has slightly higher risk of post- surgery infection . Both methods have very similar successful results. Most people have perfect vision after the surgery while a few people will still need to wear glasses or contacts after the surgery but even for them the prescription will be much lower than before. Lasik procedure is the most popular method used today, but this does not mean that it is the most suitable laser surgery procedure for everyone. Your doctor will examine you first and will decide which method suits your needs best. 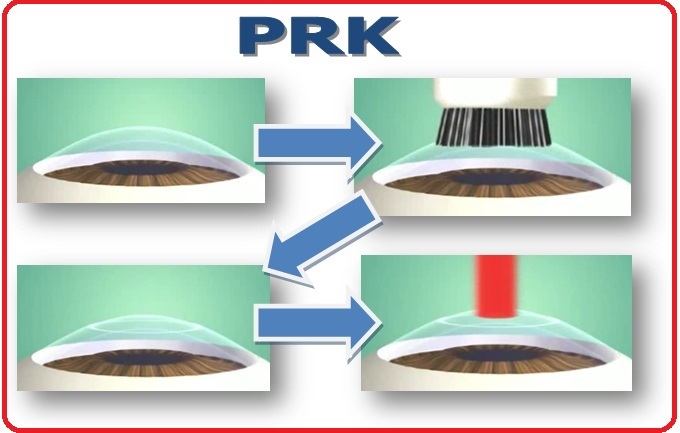 For some people PRK method is preferred over LASIK mainly because of the different thickness of the cornea that each person has. All in all even though laser eye surgery offers astonishing results, this does not mean that you will have perfect vision for the rest of your life. For example presbyopia is age related and is causing loss of near sight vision which means that someone who has performed laser eye surgery might need glasses for reading at some point of his life.